Cracked Out Turkey Pinwheels - I am ADDICTED to these sandwiches! 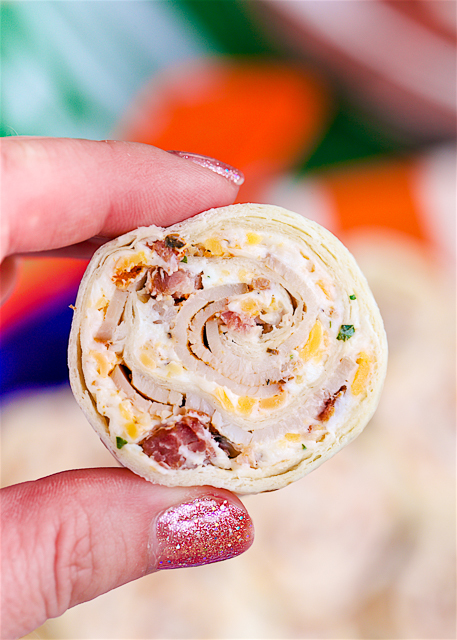 Cream cheese, cheddar, bacon, Ranch and turkey wrapped in a tortilla. Can make ahead of time and refrigerate until ready to eat. Perfect for parties and tailgating!! This recipe was inspired by Plain Chicken reader, Suzanne Smith. She emailed me last year and asked if I thought the crack dip would work in tortillas. I told her it would totally work if she swapped the sour cream for cream cheese. She made them and said they flew off the plate at her South Alabama tailgate. I couldn't wait to try them! I used Boar's Head Blacked Turkey in these Cracked Out Turkey Pinwheels. It is my favorite deli turkey. If you are a fan of the blackened turkey, just use your favorite thin sliced deli turkey. They are also PERFECT for tailgating. You can make them ahead of time and they are super easy to transport to the parking lot. 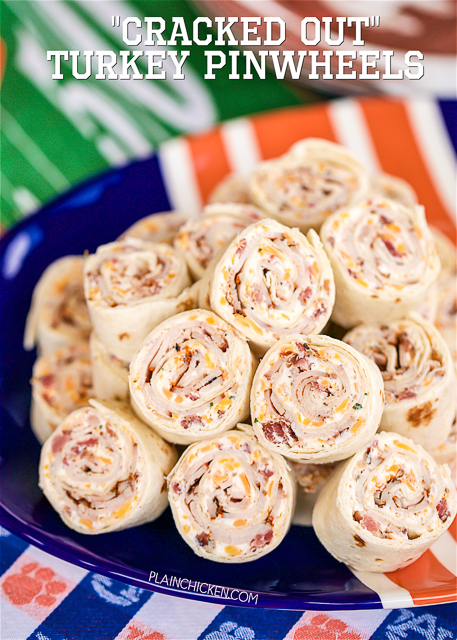 Mix softened cream cheese with the ranch powder, cheddar cheese, 1 Tbsp milk, and bacon until well combined. Add more milk if desired. Spread about 2 Tbsp of this mixture evenly on each tortilla then lay 3-4 slices of turkey breast flat on top of the cheese mixture to cover in a single layer. Roll the tortilla up gently, yet tightly to make sure it holds together and keeps its shape. Refrigerate for about 30 minutes to firm up the softened cheese. Cut off ends of tortilla roll and cut into 1-inch slices. Omg'sh! I bet these are amazing! I may make them tomorrow night for a party. Thanks! should I add the milk to the cheese mixture? yes - I'll correct the instructions. How long will these keep in the fridge? If I make will they be ok in the fridge for two days? They will be fine for two days. Enjoy! Is that ranch dips mix or ranch dressing seasoning mix? Do you think canned chicken would taste good? Instead of the turkey. I made these for Christmas eve. They were a a HUGE hit! Making them tomorrow with ham. Could these be heated to give the shell a small crunch? made this yesterday. everyone loved them. doubled all the ingredients except the bacon bits. Would big rolls freeze well before slicing? Will be making these for my New Years Eve party with my family this year. They look and sound AMAZING! Might have to make a practice run during Christmas movies in about 3 weeks. Thanks. I think i'll try some deli ham also minus the bacon. Make 2 one ham roll and one turkey roll. Maybe some deli chicken also. Thanks for the inspiration on different kinds to make. I'm creating a round-up for easy lunchbox ideas for kids. Can I add your recipe. I'd be sure to give a link back to your recipe and credit you for it. I took the leftover turkey breast meat threw it in the food processor, with celery, onion, rainbow carrots, honey mustard and Aldi brand salad dressing aka Miracle Whip and made a spread. Then I said now what? It tasted great but after receiving your ideas in my inbox this morning, I'll add some cream cheese and some cheddar and bacon to it and make pinwheels. So thank you very much!!! About how many does it make? HOW MANY WILL THIS FED? How many carbs are in the pinwheels per serving? How do you keep the tortillas from drying out? Keep them stored in an air-tight container before serving. So good! I also shredded some carrot into the cream cheese mixture to give it crunch. I made these to pack in my kids' lunches for school and they absolutely LOVED them! I of course had to taste one for myself and oh my, these are so good! They're so easy too. I'm going to have to make them for a party. The kids have already requested them again this week. One small change, I used almost the whole packet of ranch seasoning mix. We like our ranch flavor strong. I suggest you add it like the recipe suggests, then taste and add more if you see fit.